Have you ever tasted skyr? It’s a cultured milk product, and an ancient one in Norse society. You’ll remember Ceridwen discovering it when she first arrived on Gotland in The Hall of Tyr, and how much she liked it, drizzled with a little of Tindr’s honey. 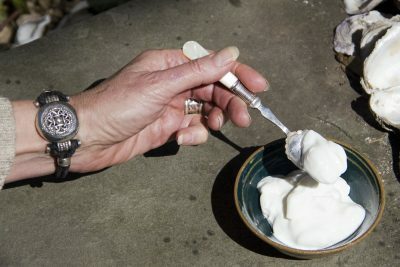 Today it’s known as a traditional Icelandic milk product, and I’m fortunate enough to have as a reader Thora Dorn, a Canadian of Icelandic descent, who graciously shared her family recipe for making homemade skyr. Today many supermarkets offer skyr, oftentimes imported from Iceland, right there next to the yogurt. Pick up a small carton of unflavoured skyr to use as a starter and let’s make some skyr of our own! As Thora tells us: “The Viking settlers are believed to have brought the knowledge of skyr-making with them from Norway, and developed it further after settlement. It is still made in Iceland. Skyr looks like thick yogurt, and the taste is similar. But skyr is not a yogurt, it’s actually a type of fresh cheese. Because it is made with skim milk, the fat content is very low, …it is also an excellent source of calcium and high in protein. Making it takes time, but it’s well worth the effort. There is a special bacteria culture that gives the skyr its unique taste, and the best way of getting the bacteria into a new batch is by mixing a portion of skyr into it. Sour cream or buttermilk can be used in place of skyr (as the starter), but the taste will be slightly different. My family is quick to point out that skyr is only truly skyr if you use Icelandic skyr to start it, otherwise it is just a soft cheese, though similar in flavour. Either way, it is delicious. This recipe makes about 4 servings. Store refrigerated up to 4-5 days in a closed container. *Skim milk should preferably not be pasteurized (the skyr will taste better). 1. Heat the skim milk up to 86-90°C (187-194°F), and cool slowly for about 2 hours, down to 39°C (102°F). Stir the prepared skyr with a little boiled milk and mix into the milk with the rennet (if you are using dry rennet, dissolve in a little water before adding). 2. Close the cooking pot and wrap in towels or a thick blanket. The milk should curdle in about 5 hours. If it curdles in less than 4 ½ hours, the curds will be coarse, but if it curdles in more than 5 hours, the skyr will be so thick it will be difficult to strain. When the milk is curdled, cut into the curds with a knife. When you can make a cut which will not close immediately, then you can go on to the next stage. 3. Line a sieve or colander with cheesecloth or a fine linen cloth and pour in the skyr. Tie the ends of the cloth together over the top and hang over a bucket or other container so the whey can drip off. If the skyr-making has been successful, there will be little whey, and it will not float over the curds, but will be visible along the edges of the sieve and in the cuts you made in the surface. You can judge the quality of the skyr from the appearance of the curds when you pour them into the sieve. If the skyr is good, it will crack and fall apart in pieces, but should neither be thin nor lumpy. Do not put a layer thicker than 7-9 cm. into the sieve. Keep the sieve in a well ventilated room, with a temperature no higher than 12°C (54°F) and no lower than 0° Celsius (32°F). The skyr should be ready in 12-24 hours. 4. The skyr should be firm and look dry when ready. The whey can be used as a drink, to pickle food, or as a replacement for white wine in cooking. Do NOT throw whey down the drain, as it will cause it to clog. Possible problems: If the whey does not leak off the curds or floats over the curds, or the curds do not shrink from the edges of the sieve, then something is wrong. The milk has not been heated to a high enough temperature or has been cooled too quickly, so that the rennet has not had time to work. The more milk you curdle at a time, the relatively less prepared skyr and rennet you need. A large container cools slower than a small one, and the effects of prepared skyr and rennet last longer. About the prepared skyr: It is best to use fresh skyr as the starter. If the skyr is sour, it should be mixed into the milk while it is still 80°-90°C (176-194°F) hot. This will remove the sourness. Don’t add the rennet until the milk has cooled to approx. 40°C (104°F). When the weather is cold, it is best to mix it in when the milk is a little over 40°C (say, 41° or 42°C or 106-108°F). In cold weather, the milk also needs to be covered more tightly while it curdles. This is especially important if you are making a small portion of skyr. I’ve tried to make my own Skyr 4 times now and while I love the texture, there is a strange, very sour aftertaste. If I add my yogurt when the milk is 176-194 degrees, won’t I kill my bacteria cultures? Is there even any bacteria in the yogurt if I add it when the milk is that hot? Also, I’ve noticed it’s less sour if I use Fage instead of Siggis. Is that okay to do? Thanks for your help!